I discovered these eggs today in a tiny nest atop a porch light on Kilian Drive. Five are pale blue-green and the size of medium olives. The sixth, much larger and mottled in brown, represents a major drama in the bird world. The smaller eggs, you see, were laid by a house finch, a salt-and-pepper-gray, sparrow-like creature with a cheery, twittering song. The male house finch sports a blotch of red on its crown, as if its head has been dipped in ketchup. Originally from Mexico and our Southwest, the house finch was introduced to Long Island in the 1940s, where entrepreneurs tried to sell caged specimens as "Hollywood finches." Although they never caught on, a few pairs were released into the wild and quickly spread over most of the East, where they thrived by supplanting the sparrow population. Today, ornithologists estimate U.S. house-finch numbers at more than one billion. House finches are vegetarians. While the female sits on the eggs (this one fled when I intruded with the camera, chattering angrily from a neighboring sugar maple), her mate continually flies in to feed her wild mustard, thistle, knotweed, poison oak, and other seeds, as well as cherries, pears, plums, strawberries, blackberries, and other fruits. One of her favorite snacks is dandelion seeds. Now for the drama: This pair of house finches doesn' t know it, but they are raising someone else's baby. At dawn a few days ago, a female brown-headed cowbird flew to the nest, and in less than a minute, deposited the brown-mottled egg. She may also have thrown out, or even eaten, one of the house-finch eggs. 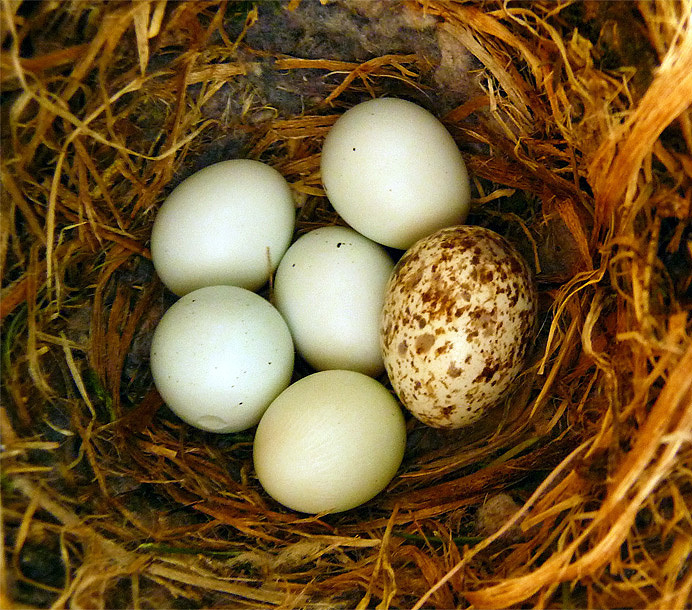 Cowbirds are North America's most notorious brood parasites. They originally lived a nomadic life, feeding on insects and seeds stirred up by herds of bison. Today they have adapted to the American suburb, laying eggs in as many as 220 other species' nests. Most of the cowbird's unwitting victims raise the intruder's young along with their own. Others push the foreign eggs out of the nest. Still others smother them with new layers of nesting material. House finches do none of the above. Instead, they inadvertently foster an ornithological tragedy. Both male and female finches feed the fledgeling cowbird the same as their own. But cowbirds aren't vegetarians—they need animal protein in their diet. Hence, although the baby cowbird usually hogs a lot of the food, it inevitably dies of malnutrition. Now I am faced with a moral dilemma. Should I rid the nest of this cowbird egg before it hatches into a baby that steals food from its five nestmates, only to die in the end? Or should I let nature run its course without human interference? .